Image by rcarver via FlickrSince it’s inception, Twitter has been known as the place people talk about what they are doing. But when you have millions of people around the world talking about what they are doing, thinking, seeing, etc, Twitter becomes "what’s happening now". 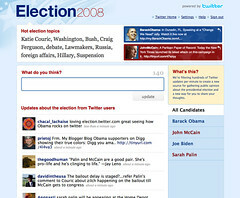 And in that light, Twitter launched a new service last night called Election.Twitter.com. First, and most importantly, you don’t have to be a twitter member or user to use election.twitter.com. For many people, it will simply be a way to quickly check in on the zeitgeist of the election. If you are a twitter user, you can join the conversation by posting directly from election.twitter.com and your update will go to everyone who follows you and into the election timeline. Twitter launched this new service in time for tonight’s debate (or town hall meeting depending if McCain shows). I plan to watch in our living room with the debate on the big screen and election.twitter.com on the coffee table on a laptop. It will be like the stock price feed that flies across the bottom CNBC when the market is open. I expect it will add a new dimension to the debate watching experience and I am excited about it.